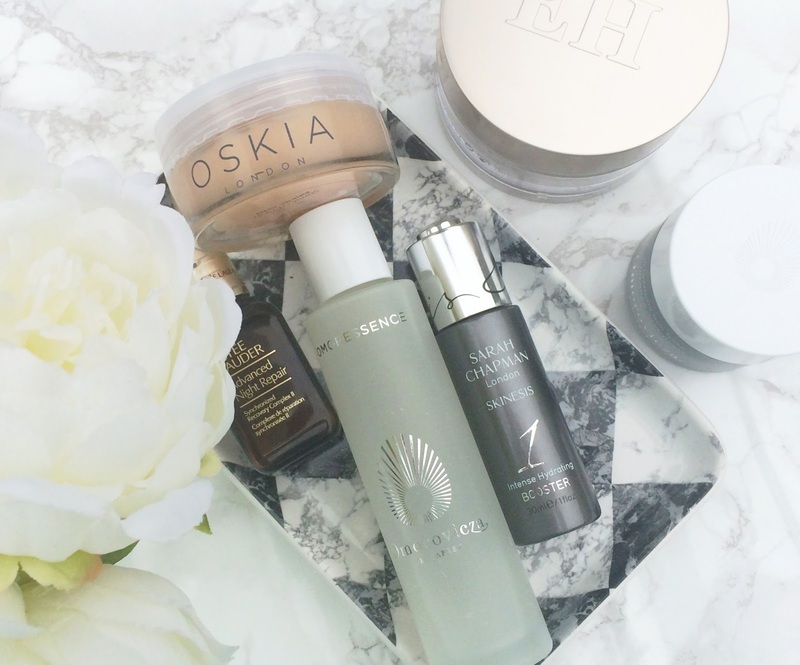 Top 5 high end skincare buys featuring Omorovicza, Sarah Chapman, Oskia & more! Last week I posted my top 5 luxury beauty/makeup products (here) so I decided to follow that up today with my top 5 luxury skincare buys. As you probably know, I am a bit of a skincare junkie and my skin is dry, (was) dehydrated, is sometimes uneven in tone, has some visible pores across the cheek area and is sometimes congested on my chin and along my jaw line - I really paint a pretty picture, don't I? Therefore, I look for products that will hydrate, moisturise, refine pores, improve texture and generally make my skin look radiant and plump - I don't ask for much! I had a difficult time choosing my top 5 products because I have a lot of skincare products that I use regularly but these are the ones that I know I can rely on to give the best results and actually make a difference to how my skin looks and feels. I have also slightly cheated by adding one product that deserves an honourable mention! Estée Lauder Advanced Night Repair: This is the product that is a non-negotiable for me - it has been a staple for me since I first began using it around 8 years ago. It is a serum/treatment that is not greasy and not too watery in texture, is easily absorbed and really is a wonder product. This product reduces inflammation/redness, reduces dryness, hydrates and plumps the skin, reduces the appearance of fine lines, repairs scars - it basically does everything you could ever want a skincare product to do! I can't think of a skin type that wouldn't benefit from this cult product. It is quite expensive, but a 50ml bottle lasts around 6 months. If I could only keep one luxury skincare item, this would be it. It is a product that I will forever repurchase. Emma Hardie Moringa Cleansing Balm: My preferred cleanser type is definitely a balm and this really is one of the best. It isn't too stiff in texture and it feels really moisturising without leaving any film on the skin. I scoop a small amount out of the tub and them massage it into my skin and I really like to take my time doing this, before adding warm water to emulsify, then I massage again before rinsing. It leaves the skin feeling very clean yet not at all stripped and very nourished. It can also be used as a mask by applying a layer and then leaving for 10 minutes before rinsing. The tub contains 100ml, which is brilliant because my second favourite cleanser, which is Omorovicza Thermal Cleansing Balm only contains 50ml and I find that I fly through the tubs. Omorovicza Omoressence: I love Omorovicza as a brand because the products are so gentle, due to the healing powers of the Hungarian Healing Waters that are used in all of the products, yet the products that I have tried have all been very effective and really do make a difference to the skin. My skin is dry but I cannot say that it is dehydrated these days and that is thanks to Omoressence, which I have previously reviewed here. Before using this, I had never used an essence before but I have used it every single day since receiving it and now cannot be without it. After cleansing, acid toning and hydrating, I apply a few drops of Omoressence to my skin and pat it in. I then wait around 2 minutes before I apply my serum, eye cream and moisturiser. Within a few weeks of using this product, I noticed that my skin no longer had patches of dehydration and it is not just an initial effect that wears off after a while - my skin is still dry but no longer dehydrated. It is a heavy bottle, so I couldn't bring it on holiday with me and in that week, I could see and feel a difference in my skin - the little patches of dehydration had started to creep back in and my makeup didn't sit as nicely on my skin. It is expensive at £75, but I expect this bottle to last me for around a year judging my how much I have used in the 3/4 months that I have been using it because only a few drops are required each day. Sarah Chapman Skinesis Intense Hydrating Booster: I have a lot of serums but this is the one that jumped out at me when I was narrowing down my products because it is just like a drink for the skin. It has an oily/watery texture but it absorbs immediately and my skin feels so silky soft to touch when I use this and also looks and feels really smooth. It also soothes my skin if I am going through a period of inflammation, which can occur do to my illness but also due to the medication that I take, and relieves that horrible tight feeling. It contains hyaluronic acid so is especially beneficial to anybody with dry or dehydrated skin. Skinesis products are expensive but unlike the Morning and Overnight Facials, which only contain 15ml, this contains 30ml of product and I prefer it to both of the Facial products. Oskia Renaissance Mask: Choosing a mask was tough and this is where there is an honourable mention! The Oskia mask won out in the end because it does everything - it exfoliates, improves the texture of my skin, refines pores, decongests, brightens and hydrates my skin. When I use this, the results are obvious immediately - my skin looks plump, feels soft and smooth and my pores are less visible. It does the job that 2 or maybe 3 masks would have done prior to discovering this mask. An honourable mention has to go to Omorovicza Ultramoor Mud Mask, which I have previously described as "spanx for your face" - this mask really does tighten the skin and makes it appear more youthful, refined and toned and due to the mud content, it also deeply cleanses the skin. I had to give it a mention because it was a very close call between these two masks but the Oskia mask has the slight edge for me due to how it helps with texture issues. All of these products are pretty expensive but this post is focusing solely on luxury skincare products, but I rarely pay full price for any skincare products. I always keep my eye out for discounts - Lookfantastic have a weekly code on their site (LF15), which gives a 15% discount and they regularly send emails with a 20% discount code. Feel Unique and Cult Beauty also periodically send emails with discount codes so it is worth signing up the newsletters on these sites to avail of those. This post is not sponsored, I just wanted to let you know where/how I get the discount codes to take the sting out of the price tags. I would love to hear your thoughts on these products and on luxury skincare, in general? What are your favourite luxury skincare products? I'd love to hear in the comments below!